A group report presents the results of a survey that reflects how well a number of their employees demonstrate emotionally intelligent behaviours in the workplace. The following group report options are complimentary and available to Genos EI Certified Practitioners. The Genos Group Report presents aggregate results of a survey group, and is generated in Microsoft PowerPoint format (which can be exported into PDF). This report can be generated for any Workplace Behaviour or Leadership assessment group containing more than one participant (for e.g. 20 people completing a 180° Workplace Behaviour Feedback Report). 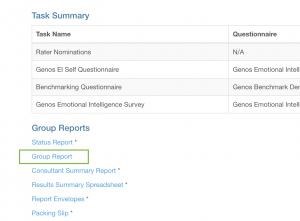 For Genos Surveys administrators, this report option will appear in the “Group Reports” section at the bottom of the group overview screen (as shown in this screenshot). This report can also be requested via the Survey Request Form when requesting a Genos-managed service. The Genos Engagement Overview provides aggregate results of an employee engagement survey, and is generated in Microsoft PowerPoint format (which can be exported into PDF). there are at least two (2) participants and at least five (5) engagement surveys completed by any Direct Reports within the group. contains highly sensitive information and needs to be treated with the utmost of care. A particularly powerful aspect of the Consultant Summary Report is the ability to generate this report to be used to help prepare for a group-based debrief. If you think about a typical group-based debrief, where there can be up to 15 people in the room, you are likely to have results that range from low to high with some people in the middle. Understanding where people's results sit in such an accessible way before you start your session can therefore ensure you are making the most of your time. This report is designed for the above-mentioned purposes and should not be shown to a participant in the given cohort or any individual not involved in either talent management, development or program facilitation activities. Participant results appear in this report from lowest scores to highest scores, i.e. the person who scored lowest on the Genos Survey is presented first and the person who scored highest appears at the end. Each participant’s results are presented over four pages. The first two pages present their overall results (average of all demonstration scores) for each competency. The second two pages detail their average demonstration scores for each item (or question) of the survey by rater category. They KEY below each set of item scores shows the rater categories that provided feedback. Where more than one rater in a category provided feedback, the number of raters is shown inside parenthesis.